Anyone who follows me here or on Twitter may have picked up on my ‘like it but keep forgetting to use it’ attitude towards FriendFeed. I mean, I see the purpose of it, but I’m always forgetting to log in to the website – it’s not an essential part of my network yet. He added it was also available as an Adobe Air client too. It took me a few hours but I eventually found time to go an explore FriendDeck, and already I really like it. I’m still playing around with it but on first impressions I’d have to say it works well – it’s very fast, user-friendly, looks like Tweetdeck (which is a good thing) and has the ability to share, like or open the original link. 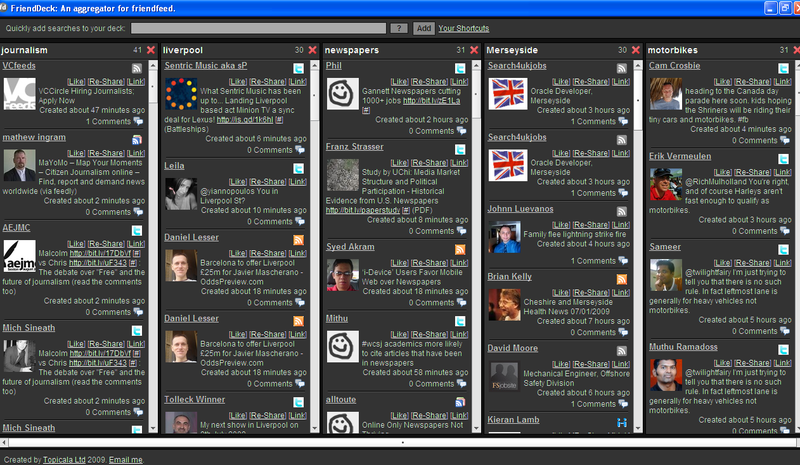 Plus I can post direct from it, and close off columns as I wish, and add new ones. Anyway. If you want to try it you can find FriendDeck here. I think I’ve finally found something that will make me use FriendFeed regularly.